Is Britain's fiver about to become a 'Winston'? 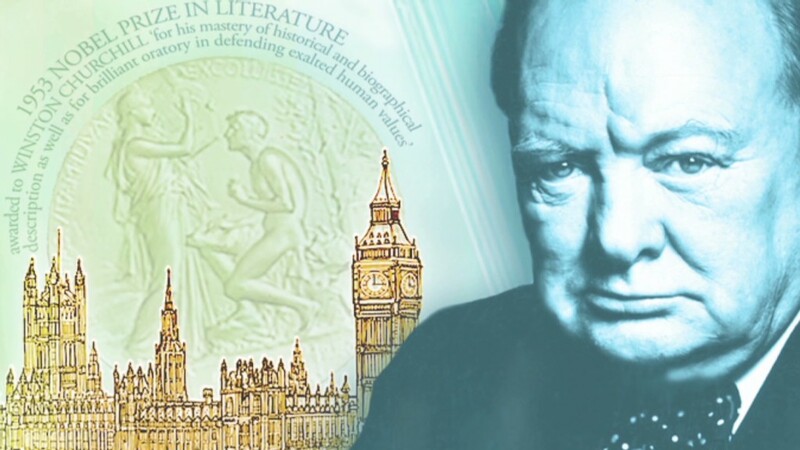 Beginning in 2016, the U.K.'s smallest banknote -- the £5 note -- will feature a portrait of wartime leader Winston Churchill, commemorating his achievements as a politician, writer and orator. "It seems entirely appropriate to put Sir Winston on what is probably our most popular note," Bank of England Governor Mervyn King said Friday. "Perhaps the note itself will become known as a Winston." A former journalist and soldier, Churchill became prime minister in 1940 at the head of a national government, shortly after the outbreak of World War II when defeat by Nazi Germany seemed likely. His stirring speeches were a source of national inspiration during the dark years that followed, and the new banknote will celebrate one of his most famous lines, made in a speech to parliament on the day he became prime minister: "I have nothing to offer but blood, toil, tears and sweat." Churchill was defeated in an election in 1945 but returned as prime minister in 1951. In recognition of his leadership, he was granted U.S. citizenship in 1963, two years before he died, and became the first Briton to have a U.S. warship named after him. The Bank of England, which produces over one billion banknotes a year, began promoting eminent Britons from the past on the reverse side of its notes in 1970. The front is reserved for an image of the monarch. Churchill will follow 19th century prison reformer Elizabeth Fry on the £5 note. Naturalist Charles Darwin is currently featured on the £10 note and economist Adam Smith's image is on the £20 notes.